Amazon is having a $5 Magazine sale that ends today!! This is for a one year subscription! You an score favorites like All You Magazine and Southern Living Magazine. NOTE: Some of these subscriptions include an auto renewal feature! Disable your auto renewal using the Magazine Manager on your account. This is the BEST deal I have EVER seen on one of my favorite magazines! 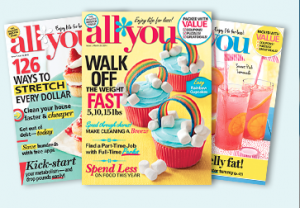 Get a One Year Subscription to All You Magazine for just $5! That’s just $.42 per issue! If you’re not familiar with All You Magazine, they’ve got great recipes, money saving tips, coupons, and more! I’ve been a subscriber for years and my subscription just recently ended, so I’m DEFINITELY taking advantage of this! This offer is available through the end of the month and we probably won’t see it gain for another year, so grab it while you can! All You Magazine just $.63 per issue! If you haven’t discovered All You Magazine, it’s the perfect time to check it out! You can get a 2 year subscription for just $15, which breaks down to just $.63 per issue! I have been a subscriber for years and LOVE IT! They’ve got great recipes, money saving tips, coupons, and more! This sale ends on Monday, February 16th, so take advantage of it while you can! All You Magazine BOGO FREE sale! The All You Magazine BOGO FREE Sale is BACK! If you’re looking for a gift idea for someone who has “everything” consider giving them a subscription to All You Magazine! They just announced an awesome sale! Get two All You Magazine Subscriptions for the price of one! You’ll pay just $19.92 for both subscriptions, which is just $.83 per issue! It is $2.49 in stores! Grab one for yourself and grab one for a friend or family member! This is one of my favorite promotions! 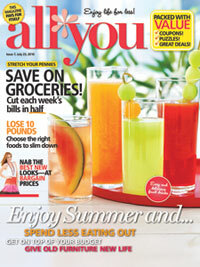 If you’re not familiar with All You Magazine, they’ve got great recipes, money saving tips, craft ideas, and coupons! I have been a subscriber for a few years now, and my current subscription is up for renewal, so this deal came along at the perfect time! Please allow 4-8 weeks for your first issue to arrive. 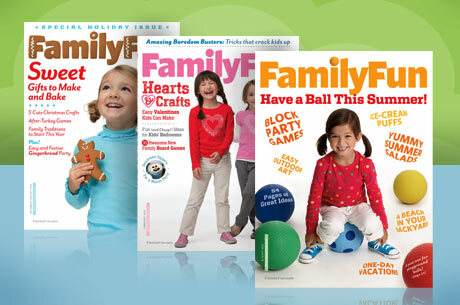 Family Circle, Family Fun, and Parents Magazines $3.52 per year! Best Deal Magazines has some GREAT deals on family magazines this week! You can get a one year subscription to Family Circle, Family Fun and Parents Magazine for just $3.52! That’s just $.29 per issue! I subscribe to both magazines and have for years. I love Family Fun because they have great craft ideas and kid friendly recipes. I love Parents because they have great product reviews, parenting tips, and COUPONS! Family Circle has great slow cooker recipe ideas! Enter the code 25OFF at check-out to take advantage of this promotion! There are lots of other great magazine deals, too!